The new 4th edition of our most popular title, it's THE book on laboratory quality control. A standard reference on QC for thousands of laboratories around the globe. BASIC QC: REVISED AND UPDATED! 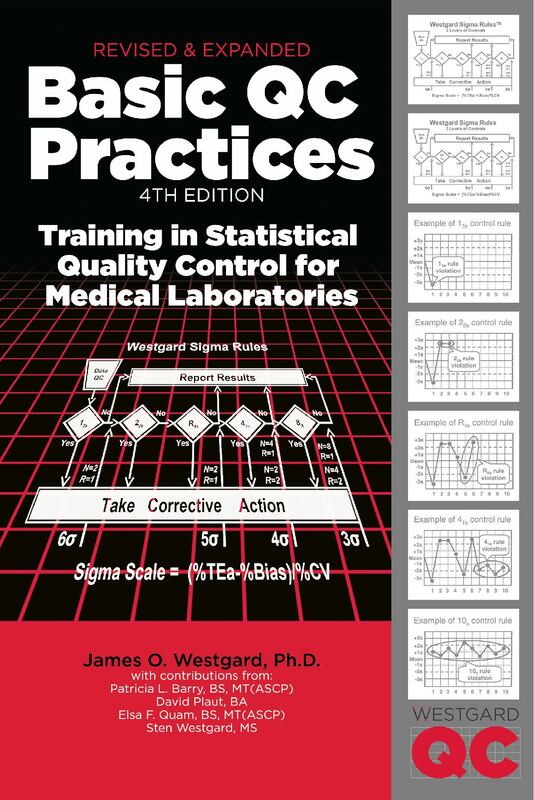 THE BEST EXPLANATION OF THE FUNDAMENTALS OF QC, LEVEY-JENNINGS CHARTS, and "WESTGARD RULES"
Thousands of laboratory professionals have made the Basic QC Practices their standard reference on laboratory quality control. "This extremely readable book delivers what it promises, and more…It is a refreshing blend of theory and practical advice that is useful for teaching, for review, and for everyday laboratory operations." "It is an ideal reference for those who want to implement and operate valid QC procedures in central laboratories or point of care testing settings… I enjoyed working through the book and visiting the Internet references. Books on quality control can be boring, this is not one such book."